Begin in Dublin where after some time to explore the city, you will discover one of Dublin’s famous knitting shops; the Constant Knitter. 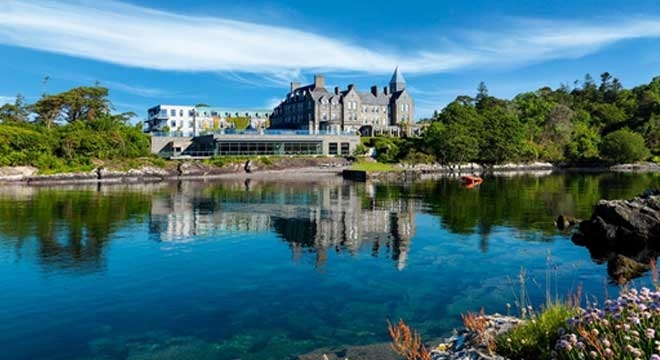 The next day we will head south to Kerry and check into the beautiful Parknasilla Resort Hotel. Here meet one of Ireland’s top knitters, Carol Feller. You will spend four days with Carol, learning her seamless cables, short row and grafting techniques and relaxing in the surroundings of your retreat hotel. We will have some optional tours lined up so that you can get out and see the local countryside if you wish! The company of your knitting host Carol Feller for 4 days. Begin your knitting tour of Ireland with a transfer to your hotel (for arrivals prior to 11am). At 1pm enjoy an optional panoramic tour of the city including a visit to The Constant Knitter. This has been a favoured stop of many of our knitters through the years. Meet a local craftsperson for a demonstration and informal chat about their craft topic which will either be knitwear design or Irish Lace crochet depending on designer availability. Return to your hotel where you will have time to relax or take a walk around Dublin City before your evening welcome dinner at the hotel. Overnight in Dublin, Dinner, Bed & Breakfast Included. Today your knitting retreat will take you to Kerry via the remarkable Cahir Castle. One of Ireland’s best-preserved Castles, Cahir sits on a rocky island above the river Suir. Once the home of the powerful Butler family, the castle’s keep, tower and defensive structures remain intact. Continue to Parknasilla Resort Hotel and meet your host, one of Ireland’s most famous knitters, Carol Feller. You will spend a lot more time with Carol over the few days spent in Kerry, so this evening is an informal get together and ‘get to know each other’ session with some informal knitting thrown in for good measure! Overnight at Parknasilla Resort Hotel, Dinner, Bed & Breakfast Included. Day 3: Knitting, Whiskey, Chocolate and Trad! Over the course of this knitting retreat you’ll work on a very special cabled hat and cowl set with Carol which you will start today. Both of these patterns will provide a great learning experience as they are knit from side-to-side with some fantastic techniques! You’ll learn how to do a provisional cast-on, cables without a cable needle, short rows in pattern and grafting in pattern. Carol will walk you through every step of the project over the following days. Learn how to tighten up loose cables and fix cable mistakes. Go on a virtual tour of the Irish Mills with Carol and even learn how to pick the right size garment to knit. This afternoon, enjoy a Whiskey and Chocolate Tasting Event where experienced whiskey and chocolate connoisseurs will take you through the history of Whiskey in Ireland and how to pair it with the perfect chocolate flavour. You can enjoy samples of both or either! This evening after dinner enjoy a Traditional Irish Music Show in the hotel’s bar. Overnight at Parknasilla Resort Hotel, Bed & Breakfast Included. Today you can opt to stay at Parknasilla and enjoy some of the facilities on offer. Pamper yourself at the hotel’s Spa, surrounded by the natural beauty of woodlands, ocean and mountains; let your troubles drift away as you take in this awe inspiring backdrop, enjoy a round of golf at the nearby course or just relax in the wonderful surroundings. Alternatively, you join us for a tour of a section of the Ring of Kerry which will include a visit to Kenmare, Sneem and Ladies View or Molls Gap. Return to the hotel where there will be time to relax and work on your knitting projects. Overnight at Parknasilla Resort Hotel, Bed & Breakfast Included. Again, today if you prefer to stay at Parknasilla you can do that or join us for a tour of the Sheep’s Head Peninsula in Cork. If you do decide to tour with us, bring your knitting! Today we travel to Cork across the magnificent Healy Pass. The Healy Pass is known for some of Ireland’s best views. It was built in 1847 during famine times to connect Cork and Kerry and to provide relief work for the poor. There are a number of places to stop where you can get out and enjoy the view. After a short stop continue to Sheep’s Head and meet Niamh and the other organisers of the annual Sheep’s Head Yarn festival. Enjoy some knitting sessions with Niamh and the gang on the topic of travel sock knitting or textured stitches depending on your preference. After the workshop and some lunch we will explore the peninsula some more before returning to the hotel in time for dinner. Overnight at Parknasilla Resort Hotel, Dinner, Bed & Breakfast Included. Today the knitting retreat ends and we travel back to Dublin, making a few stops along the way. Firstly we stop at Crampton Farm to meet Suzanne and her family who breed and rear Zwartables Sheep. Tour the farm, meet the sheep and chat with the family who will tell you all about their unique yarn which you can buy direct from the farm if you wish. Nearby is Cushendale Mill where products made on site are crafted natural-fibre textiles made with mohair, Irish wool and merino lamb’s wool. Enjoy a tour of the mill and see the spinning mule in action. You might even spot some of the wool from the sheep at Crampton farm! Continue to Dublin with a stop for lunch (included) and after checking into your hotel there will be time for you to take a walk around the city or simply relax before dinner. This evening your final farewell dinner will be served at the hotel. Overnight in Dublin, Dinner, Bed & Breakfast Included.